St. Zacchaeus was one of the Seventy Apostles of the Lord and had been a tax-collector earlier in his life. When the Lord Jesus Christ passed by him in Jericho, Zacchaeus climbed up a sycamore tree to get a better chance to see Him because he was so short in stature. Jesus spoke with him and then went to his house, and so called him to deep repentance and active life in the Church. He restored to everyone that he had defrauded four times what he had taken and gave half of his goods away when Christ called him. After the Crucifixion and Resurrection, St. Zacchaeus became a companion of St. Peter and traveled with him on his missionary journeys. When St. Peter was with him in Caesarea in Palestine, he made Zacchaeus the bishop of that city. 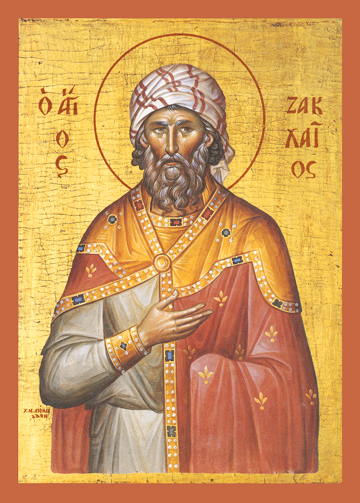 St. Zacchaeus served the faithful for years as their bishop and was an apostle to them, showing forth a living icon of Christ Whom he had met personally and been transformed from a sinning tax-collector into a bishop and apostle of the Church. How many of us would have recognized what God would do with this short and sinful man when he climbed up that sycamore tree so long ago and called out to Christ?